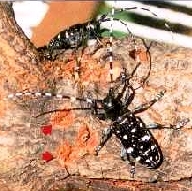 Asian Longhorn Beetle (Anoplophora glabripennis) is a potentially damaging invasive beetle species native to China and other parts of Asia. It measures up to 3.5 cm long, has a long, banded antennae and distinct, bright white spots on its shiny, black back. Other related beetles that are native to our area include the spruce sawyer beetle and poplar borer. This beetle likely hitchhiked here in wooden packing materials. It was found approximately in 2003 near Toronto and Vaughan in Ontario. It attacks a variety of hardwood trees such as willow, poplar, elm, maple and birch (easily some of our most common trees). Their larvae burrow extensive tunnels through their wood, killing even the largest and healthiest trees with ease. In addition, Asian longhorn beetles have no native predators that would help keep their populations from getting out of control. Considering how much of our urban and native forests are comprised of the above tree species, an infestation of these beetles could be devastating to our city. Forestry, tourism, public health and the stability of our native ecosystems would be impacted, costing us both quality of life and billions of dollars nationwide. Almost 29,000 trees had to be destroyed in Vaughan and Toronto to keep their Asian longhorn beetle infestation from spreading. Early detection of the beetles is important in order to avoid a similar situation here in Alberta. If you see an Asian longhorn beetle, collect the specimen or take a close-up picture and send that and any detailed information regarding the date and location to 311 or email treebugs@edmonton.ca. Beetles can also be spread by the transport of firewood - so "burn it where you buy it!"